The forecast is better, so we plan to get a somewhat earlier start with the idea of heading off to a first camp in order to do a bit of practicing and a few peaks before heading to a camp somewhat further away. We wake to a light drizzle but some signs that the clouds are lifting. 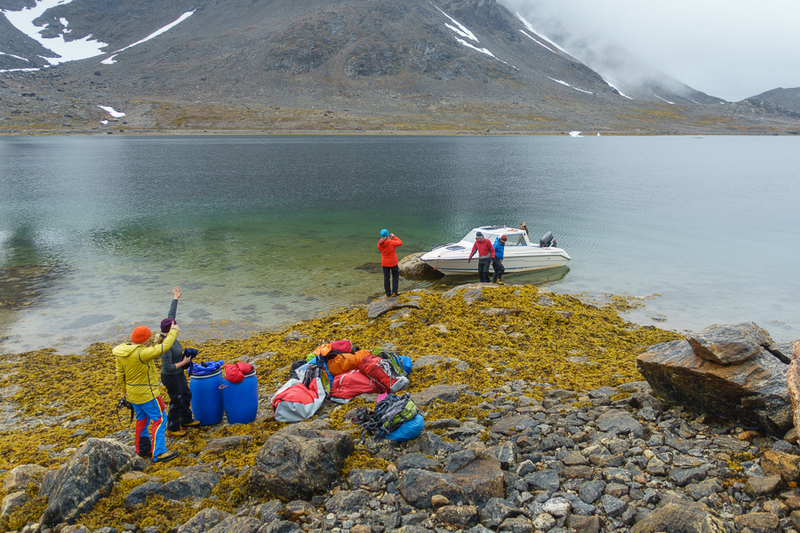 After breakfast we pack everything up, load the bags onto an ATV, and then walk down to the docks to load the boat. Piling in the boat, we head out across the bay to Apusiaajik Island, past icebergs and small islands to the mouth of a small valley not far from the glacier we've been admiring for the past couple of days. After unloading the boat we cart the first loads of stuff 15-20 minutes to the camp that Matt and John have already scoped out and set up with bear tripwires. After carting up the second load of stuff (not much fun) we pitch our tents (more fun), get set up in the tents, pitch the cooking/eating tent, and eat a bit. 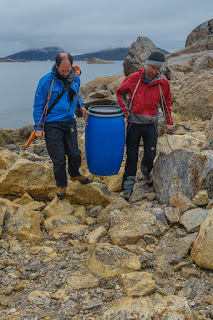 G builds a "fridge" for some food (cheese, salami, and wraps) that need to be kept cool and protected from animals and then we head back to get the two barrels with the rest of the food and lug them back to the camp (really not much fun). 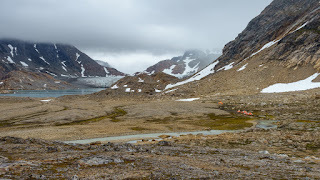 Now a bit of soup and crackers, some warm drinks, and a bit more organization and then we head off on a walk around the headland and towards the foot of the Apusiaajik Glacier. Lots of cool geology along that way (the variety of rocks is amazing) and then we see the glacier running into the sea. :-) A bit more looking around and then we head back to camp. Dinner is chicken and pesto pasta (soupy, but ok). After some more chatting and setting up the shifts for the polar bear watch (the tripwires apparently don't work so well in the rain and it is starting to drizzle again), we head off to bed. The forecast for the next day is good and there is climbing to be done! Greenland trip day 9: Yeah! No more rain!